While businesses still regard the saying that the “customer is always right”, today’s organizations that operate in a customer-not-present environment must first determine: “Is the customer actually the customer?” With the rise of online fraud, identity theft, and other scams or attacks, the security of your business is under increasing threat. 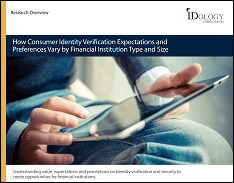 Identity proofing (also known as Identity Verification), or the means to verify and authenticate the identity of legitimate customers, has become more critical than ever. Identify proofing solutions also ensure, of course, that fraudulent users are prevented from accessing your sensitive data. In other words, good goes in, garbage stays out. It was not so long ago when identity proofing began and ended by having customers provide an email address and create a password for their account. Today, organizations must not only meet a variety of compliance regulations as well as fight fraud, but they also have to drive customer acquisition in a user-friendly and seamless way. Identity proofing services and solutions have become vastly more sophisticated, from account origination, or the initial customer contact, through the entire customer lifecycle. In addition, proofing identification solutions and services usually entail multiple identity proofing methods, each enhancing the strength of the other. The best identity proofing solutions also feature flexible criteria or settings, so that a business can respond to the changing needs of its environment or business requirements at any point in the verification process. Identity proofing has been fundamental to businesses in their battle to fight fraud, ensuring that customers are who they say they are, for a very long time. The concept of “identity” and distinguishing one identity from another can date back to prehistoric times. Today, proofing an identity and the methods with which organizations verify identities has greatly evolved. And, due to the continual rise in identity theft and ever changing fraud schemes, identity proofing as become more important than ever before. Click the below infographic image to take a look at some key markers in the history of identity proofing and see how far it has evolved. While the need to prevent fraud is a serious issue, it can all too easily distract you from the real business of business—to increase customer acquisition and revenue! Too often, business owners who are anxious to get on with their real work assume that the best identity proofing services or solutions are the most expensive or complicated. Not true. What’s more, IDology offers completely customizable identity proofing solutions that adapt to your changing needs. Flexible, on-demand, and innovative, IDology’s point and click functionality allows customers to control the entire identity proofing process and provides the flexibility to make configuration changes that are deployed automatically – without having to rely on internal IT resources or IDology’s customer service – so customers can stay ahead of the fraud landscape while maintaining compliance. When the question, “Is the customer actually the customer?”, is a concern, identity proofing is the solution. Just make sure that you opt for the best identity proofing services and solutions on the market. As a leader in the industry, IDology offers a real-time technology platform that drives revenue, deters fraud and meets compliance standards. To find out more about effective identity proofing, contact IDology today.